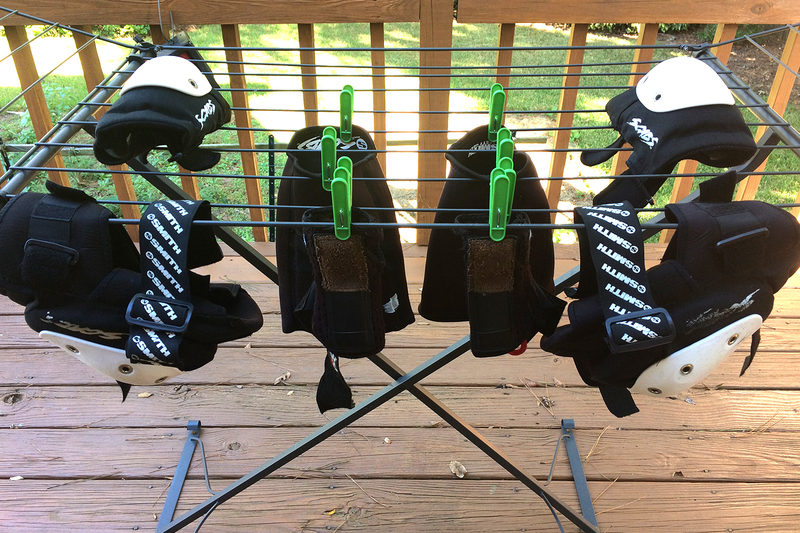 Last week we talked about how to wash your gear and as promised today we are talking about ways to dry your gear after you wash it or even after practice. We wanted to remind you that this blog post contains opinions of the writer and is meant to be a learning tool. Take the opinions we provide and do some more research to find the best fit for you. No money is being made from this post, there are no paid advertisements included below. Ideally you let your gear dry in the sun. Sun light and its ultra violet rays kill bacteria. Bacteria of course is what gives us Eau de Derby and its stronger version Derby Stank. Most of us don’t have laundry lines in our back yard so here are some portable alternatives. Click the pic to see where they can be purchased. Some people dry their gear in the dryer (which is not recommended) because it shortens the life span of your gear, but it does work. You can dry your gear in your house too. That will take much longer however, and drying time will depend on how you washed your gear. If you washed your gear in the washing machine it will have a lot of the water spun out of it. Coming out of the tub it’ll be soaking wet and take considerably longer. It will also drip quit a bit of water so laying a towel below it when drying inside is definitely a must. Getting a drying rack that fits in your tub may also be a good idea if you can not dry your gear outside due to space limitations or whatever. PRESSA can also be found on amazon. Amazon recently added IKEA products to its shop, although the prices do differ. There are many more stores that sell drying racks. These are just some really reasonably priced options we found have worked for us or our teammates. We hope these ideas help you figuring out how you can take care of your gear and keep the stank low… unless the stank is your secret weapon. Then stank on my friend! Stay tuned for more derby inspired DIYs and helpful hints brought to you by the Bout Betties team.